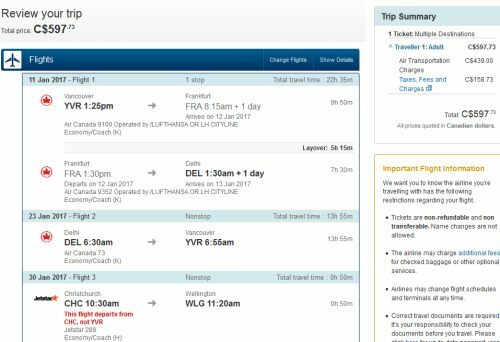 Air Canada is showing some fares between Vancouver and India that are so low, they are quite likely a mistake. It's possible other destinations are a part of this mistake, so stay tuned on Twitter @YVRdeals for updates. Update 4/28 @ 5:04 PM PST - It looks like the fares to India have been fixed. The non-stop flights to Shanghai are still available (see below). 2. You'll notice that there's an extra flight, between Christchurch and Wellington, New Zealand. This flight is somewhat irrelevant, but necessary for the mistake price. You simply would not use the extra flight. You can try experimenting with other dates to see what prices come up. I would focus on Monday, Tuesday, and Wednesday flights like in the example above. 3. Select your flights, and then click through from Google Flights to Expedia for booking. IMPORTANT: As this is likely a mistake fare, do *not* under any circumstances call the airline, and keep your expectations low. Air Canada has been known not to honor their mistake fares in the past. Expedia however, is generally pretty good for doing so. It's hard to say what will happen with this one. If you find any other interesting prices, help out your fellow traveler and share the dates in the comments section below. 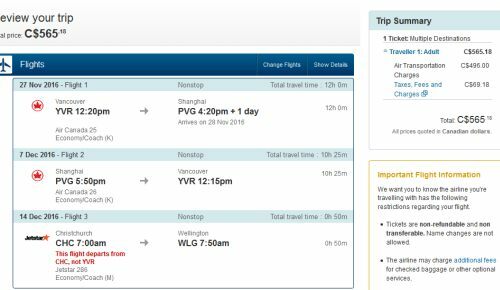 13 Responses to "Mistake fares: Vancouver to Delhi and Mumbai, India - from $599 CAD roundtrip including taxes"
When I play around with dates it doesn't show Jetstar and books it on more expensive Air New Zeland. How do I avoid this? Booked! So we will see what happened. I booked 5 tickets for December 8th returning on the 22nd and it worked out to $650 pp, Thanks Chris. Booked 26Dec - 21 jan 650. Lets see what happens. Anyone else getting stuck on the confirmation screen? Wasn't able to get the dates you had it on, expedia got stuck on the confirmation screen. Booked for $759 for mid-Feb dates (ended up booking directly on United). Still seems like a great deal! 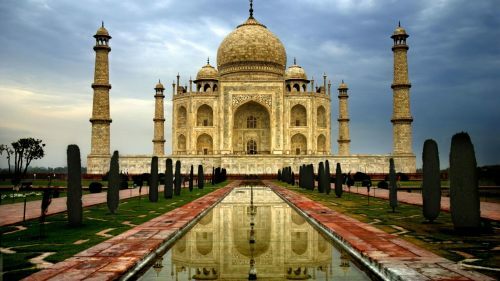 Booked 6 flights to India from August 15 - September 8 for $775 each. Thank you!! I was able to book two tickets (abut and child) for $1305. Leaving Nov 19 coming aback Dec 7Will update if aircanada says anything. Thanks Jazz. I just talked with a AC partner airline to get my booking code for their flight. So far all seems good. Booked for 2, Oct-Dec. When would it be safe to assume that this booking is ok? After how long? Kulvir, did you receive the 13 digit e-ticket number? That is the sign that the booking is solid.